On, Monday, January 8, 2018 , Major Arthur J. Martins was sworn in as the newly appointed Deputy Chief of the North Providence Police Department at a private ceremony held at Police Headquarters, joined by his wife and two children. Major Martins is a 28 year veteran of the Pawtucket Police Department, serving from 1987 -2015. Rising through the ranks during his 28 year career from Patrol Officer, Detective, Sergeant, Lieutenant, Captain and Major, he served in various capacities within the Patrol and Detective Divisions. His last assignment was commander of the Investigative Services Division where he also served as the departments Public Information Officer, responsible for all media inquiries and public record requests. In addition, he is an Adjunct Professor at Johnson & Wales University educating undergraduate students in Criminal Justice philosophies, tactics, applications and methods as well as principles of law enforcement practices, police operations and investigative techniques. 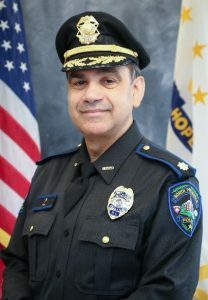 Upon his retirement in 2015 he accepted a position with the State of Rhode Island Department of Attorney General’s Office, assigned to a task force with the Office of Inspector General for the Social Security Administration Cooperative Disability Investigative Unit (CDI). Major Martins maintains a strong desire to become engaged with the community having served on the Pawtucket Boys and Girls Club Strategic Planning Committee, Blackstone Valley Youth and Family Collaborative and the Pawtucket Soup Kitchen Board of Directors. The Major is also a 2015 recipient of the John J. Coen Award for Community Service and Social Justice. Major Martins holds a Master’s Degree from Anna Maria College in the Administration of Justice, a Bachelor of Science Degree from Bryant University in Criminal Justice and is also a graduate of the 186th Session of the FBI National Academy. From my perspective, Major Martins, is an excellent fit for our department. He is an experienced, well respected law enforcement professional sharing my leadership philosophy and vision for the department. I look forward to working with Deputy Chief Martins, the Administration and FOP Lodge 13 to build upon the forward progress the department has realized over the past four months since being appointed Chief.